What’s up? Cocktails, art, and music make a heady mix at K2 Friday Nights. Café Serai becomes the K2 Lounge, offering a special pan-Asian menu to accompany the evening’s DJ. Happy hour runs from 6:00 to 7:00 p.m. with a two-for-one special on all beer, wine, and well drinks. Coming with friends? Click here to learn more about group reservations. Why you should go. The Rubin Museum is one of the city’s best kept secrets. Located in Chelsea, it specializes in Himalayan and South Asian art. Sleek and elegant, the Rubin hosts fun after-hours events including its K2, every Friday, when the museum transforms into a swanky lounge with drinks and DJ spinning electronic vibes. After remarks and tours, join the dance party in the K2 Lounge! Arrive early to check out the exhibits before the show starts. Alone or with friends? With friends! Be safe, drink responsibly and have fun! 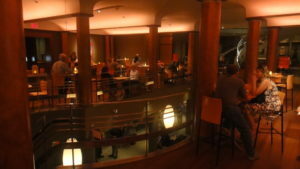 Bar Six, bar, restaurant 502 Ave of the Americas, New York, NY 10011 – Convenient, great selection and good buzz.